Finance and Risk Management junior Emily Snedeker, fourth from right, stands with her team, which advanced to the final round in the team case competition. 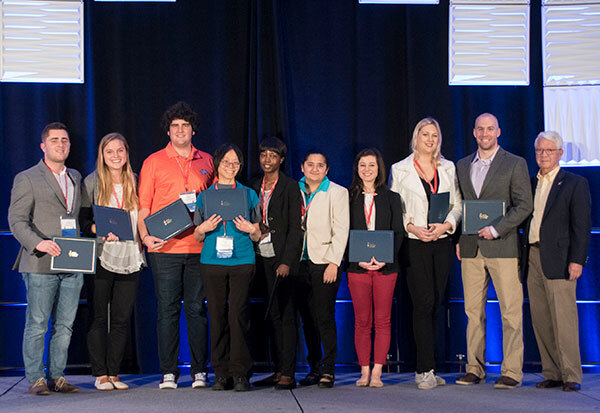 The experience at the Beta Gamma Sigma Global Leadership Summit in Orlando, Florida, from Nov. 2-5, was filled with exceptional and engaging speakers, interactive and developmental activities, and high-caliber competition and collaboration. The three of us participated in a team case competition with 35 total teams — each team composed of 10 students. With only three students per team able to present to the judges, Management junior Leah Tovar and Finance and Risk Management sophomore Rudy Martinez took the initiative and represented their teams on cases regarding the integration of artificial intelligence within a business setting. Finance and Risk Management junior Emily Snedeker qualified for the final round where her team presented on the topic of Blockchain technology, which is a decentralized, immutable and publicly accessible collection of transactions that allows market participants to record digital currency transactions without central record-keeping, and competed against four other finalists. With thirty teams eliminated to make it to the finals, this was an amazing accomplishment and is representative of the caliber of students at St. Mary’s University. Our involvement as Beta Gamma Sigma members was one of learning and professional development, and it was an experience that we feel will propel future St. Mary’s students at St. Mary’s into success. The environment at the Global Summit was one of continuous engagement. From the moment we sat down for breakfast to the moment we went to bed, we were immersed in summit events that consisted of communicating with professionals from KPMG — a renowned professional financial services company — graduate school representatives, and many other professional organizations. During the summit, we were able to engage with students from Dubai, England, Germany, New Zealand, Hong Kong and Japan, gaining insight into different perspectives of business and learning to work with a group of student leaders. It was incredible to see how we took charge within our case competition teams and contributed to their success. We ultimately had the opportunity to join forces with students from elite universities across the globe, and showcase the unique technical and leadership skills we learned at St. Mary’s University.